The home decor brand thinks outside of the white box, bringing warmth and life to a contemporary apartment. 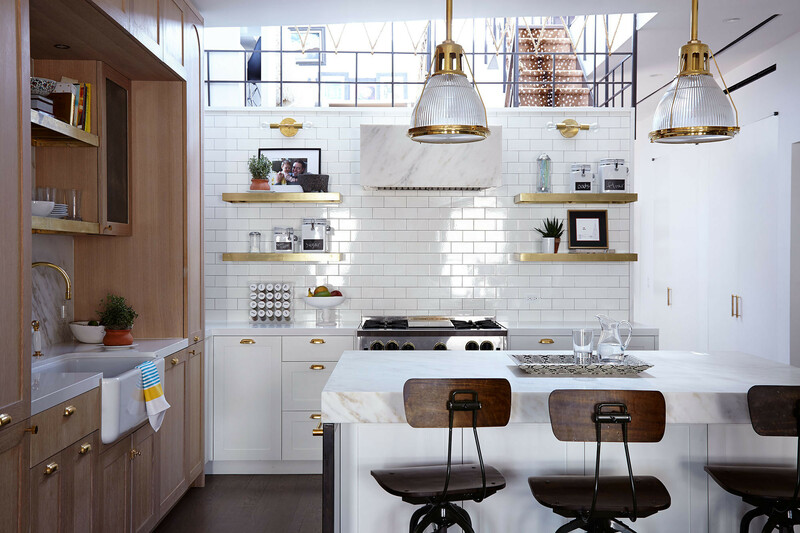 Homepolish designer Matthew Cane incorporated color and texture in a cheerful second home in New York City for a New Jersey couple. hen their children went off to college, one New Jersey couple didn't do what everyone thought they were going to do, which is flip out, turning bedrooms into gyms or crafting rooms or the like. Instead, they hopped across the river and purchased a one-bedroom pied-à-terre on New York City's leafy Upper West Side, where they could escape on weekends and design a home based solely on their needs. 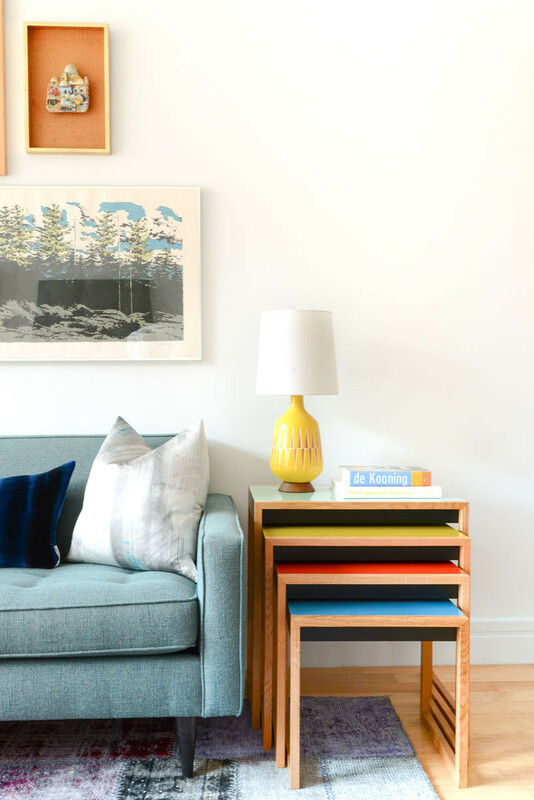 To get started, they turned to Homepolish—a service that connects style-conscious homeowners and renters with accessible interior design experts—and transformed what was a plain white box into a colorful expression of their new lifestyle. 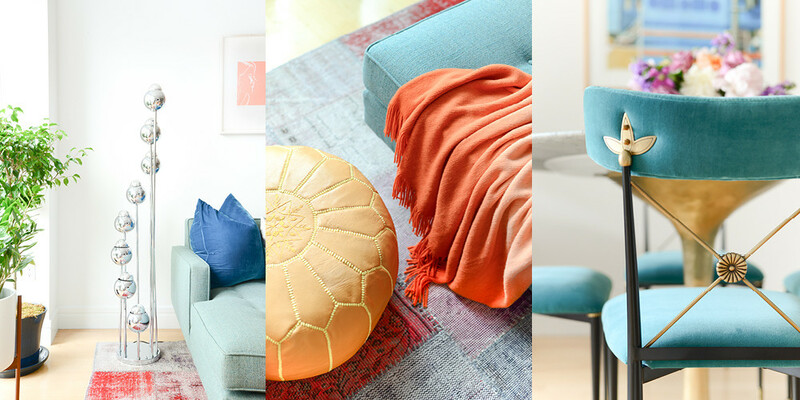 Designer Matthew Cane established a palette of primary colors—reds, blues, and yellows—plus jewel tones such as teal and pink. 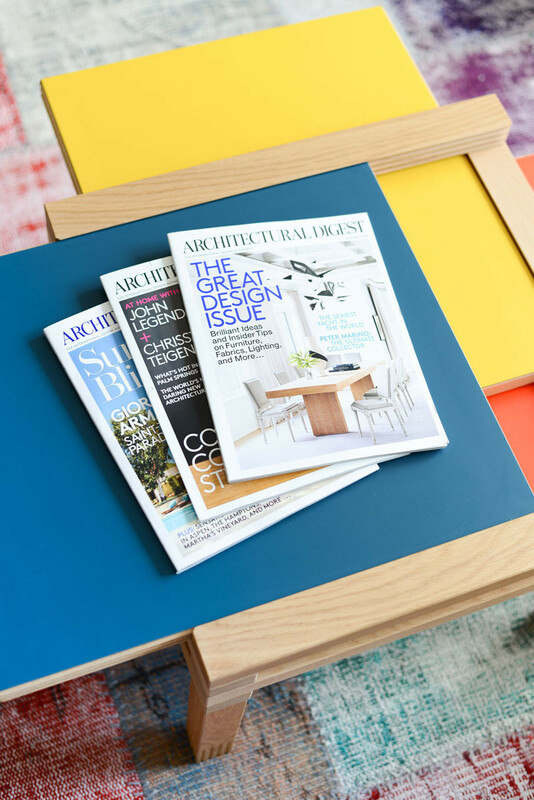 A multifunctional side table provides plenty of surface space for reading or serving while entertaining guests. 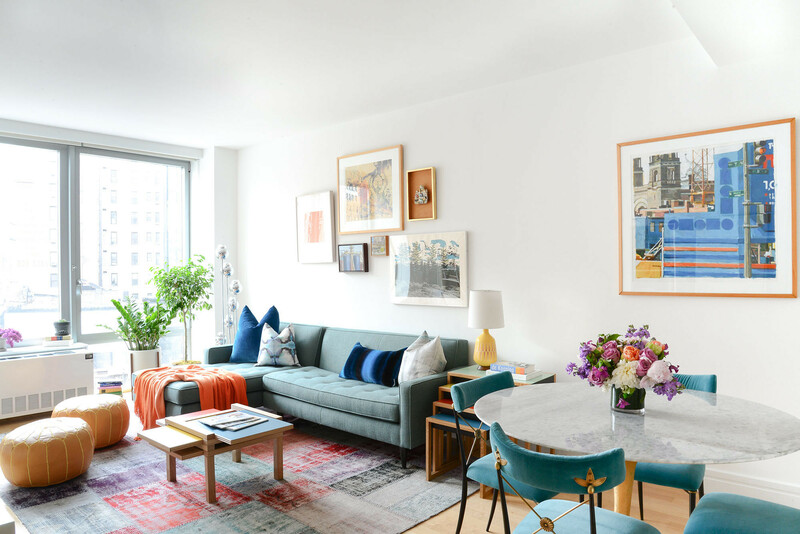 "The owners love art and color but wanted the combination to look clean and modern," says Homepolish designer Matthew Cane, who created a poppy palette of primary hues that was inspired by the couple's extensive framed collection back home in New Jersey. "I knew I wanted the living and dining areas to be packed with color and an eclectic vibe, while leaving the bedroom to have a softer elegance with splashes of yellow, pink, and teal in an all-white monochromatic foundation." So he began mixing styles and textures, incorporating traditional pieces such as Jonathan Adler's classic Rider chair in the dining room with contemporary items like a tweed-upholstered sectional from Room & Board. A custom marble-and-brass tulip table elevates the arrangement. 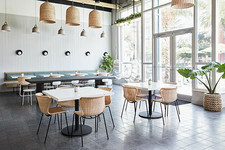 "I wanted to make sure they were as comfortable as possible within the space for reading, watching television, or dining without compromising the aesthetic," Cane says. 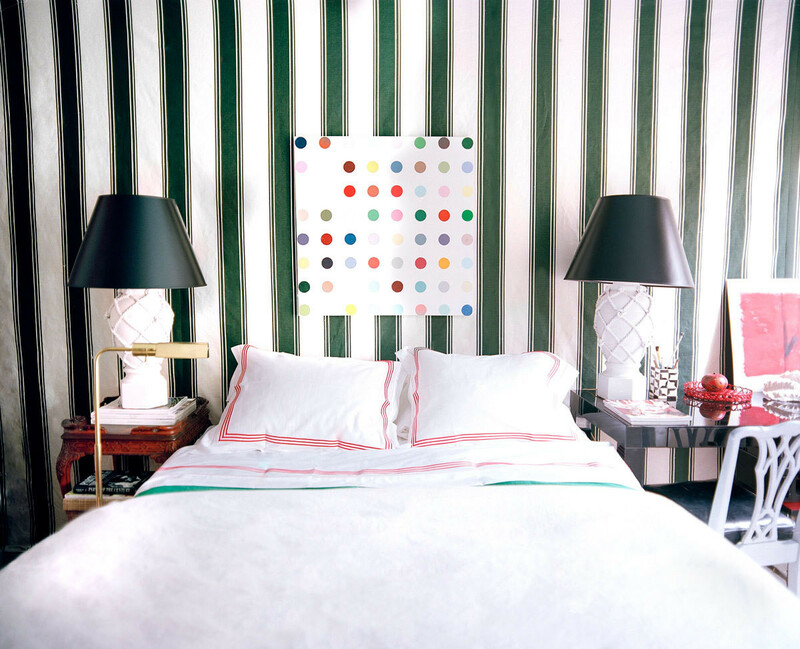 The couple brough decorative pieces such as this chrome floor lamp and artwork from their house in New Jersey to transform the apartment into a home. Leather poufs by Jonathan Adler double as additional seating and footrests. Adler's Rider chairs add a traditional note in the modern living and dining area. 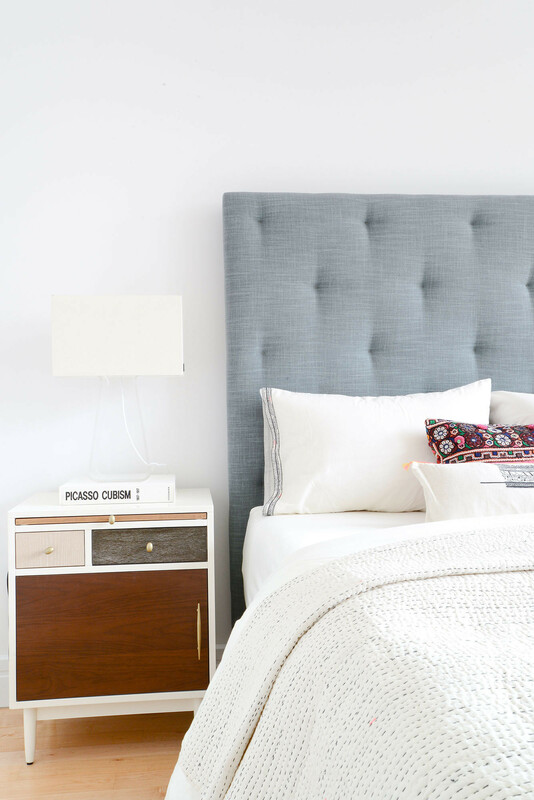 In the bedroom, a gray tufted headboard creates a neutral base for smaller pops of color and pattern that don't overwhelm the space. 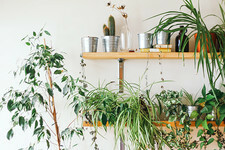 West Elm's mixed-media Patchwork nightstand lends a sense of patina and age to counter the apartment's more contemporary finishes, as does a stately potted ficus in a coordinating green pot. 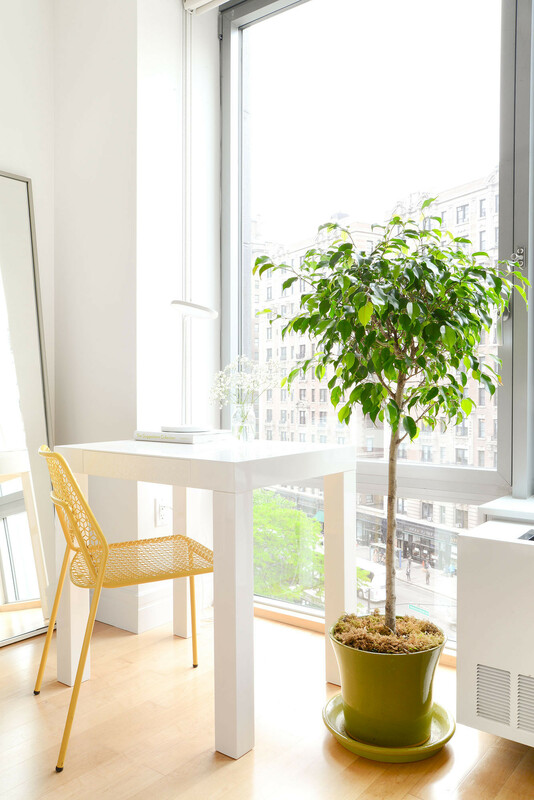 The small white table nearby is equal parts workstation and vanity, and is punctuated with a bright-yellow wire chair from Blu Dot. The combination feels serene yet personable, intimate yet approachable. "I wanted to make sure that it was a retreat from their suburban home, but that the apartment did still feel like their home," says Cane. 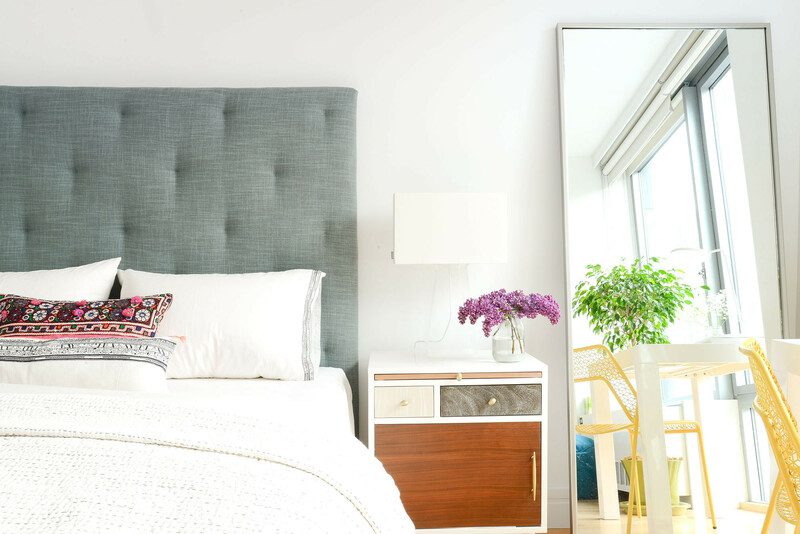 The bedroom features a more monochromatic palette, with a gray tufted headboard as a neutral anchor. A slim wire chair and Parsons table create an efficient space that is both workstation and vanity. Ironically, the colorful outbursts throughout the home were a departure for Cane. "I'm not a huge fan of color—I don't even own color in my wardrobe," he says. "But I took a lot of risks and am so glad I did because pieces like the teal sectional and dining chairs are key players in the space." 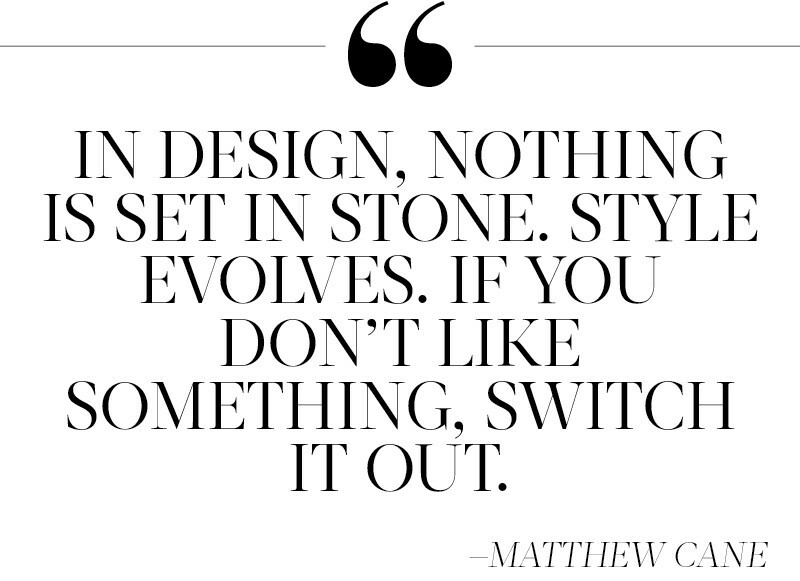 Naturally, his clients—and their children, who can be found perched on a pair of poufs by Jonathan Adler when they're home from school—agree. So much for being empty nesters. The variegated wood in West Elm's Patchwork nightstand lend a sense of age that contrasts with the apartment's sleek structural and decorative elements. 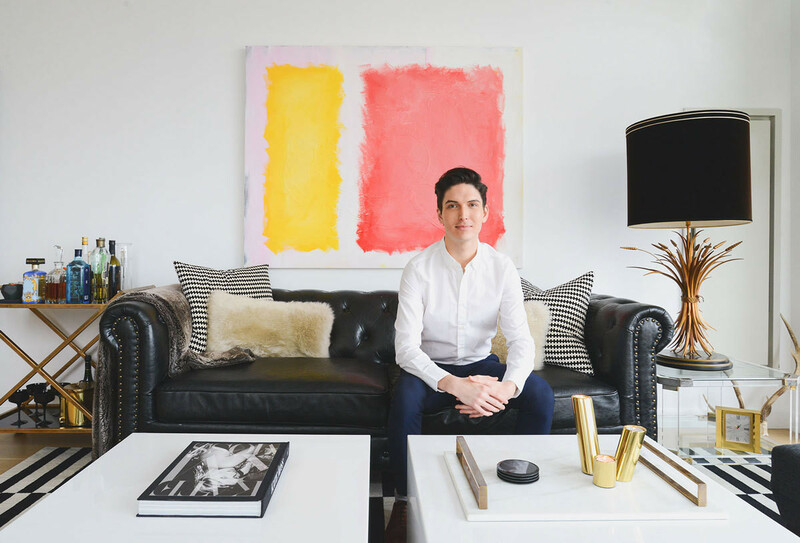 Homepolish's co-founder redesigns his Manhattan apartment with help from Christiane Lemieux. Interior designer Jenny Vorhoff creates a practical landing pad with style that's meant to last. The designer revives a dark, cramped space to create a bold, Chinese-influenced escape. 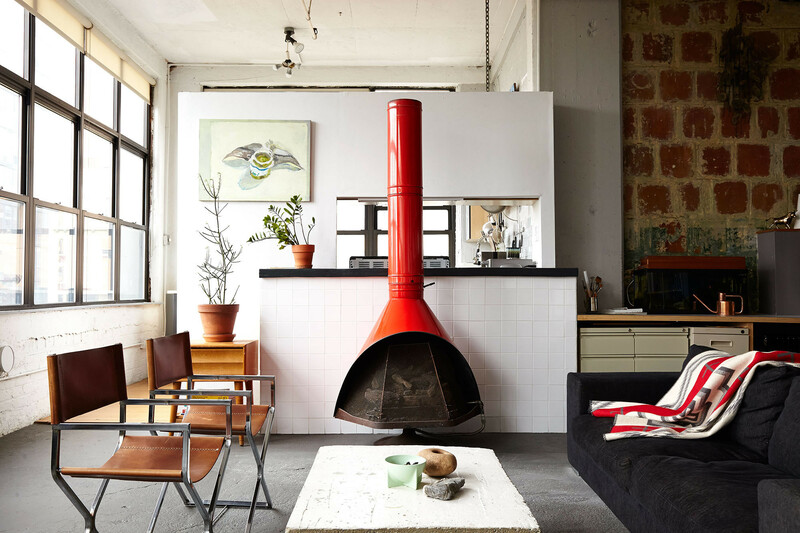 Designer Adam Davidson combines resourcefulness and refinement in his urban-rustic retreat.